In need of a 30-minute healthy dinner? You found it! 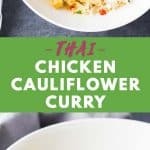 Thai Chicken Cauliflower Curry, the best, the ONLY quick and easy dinner you’ll need today! 30 minutes start to finish. Full of healthy cauliflower. Full of flavor. Super easy to prepare. And now that cauliflower is in season, a fairly inexpensive dinner, too. Win, win, win, I’d say! 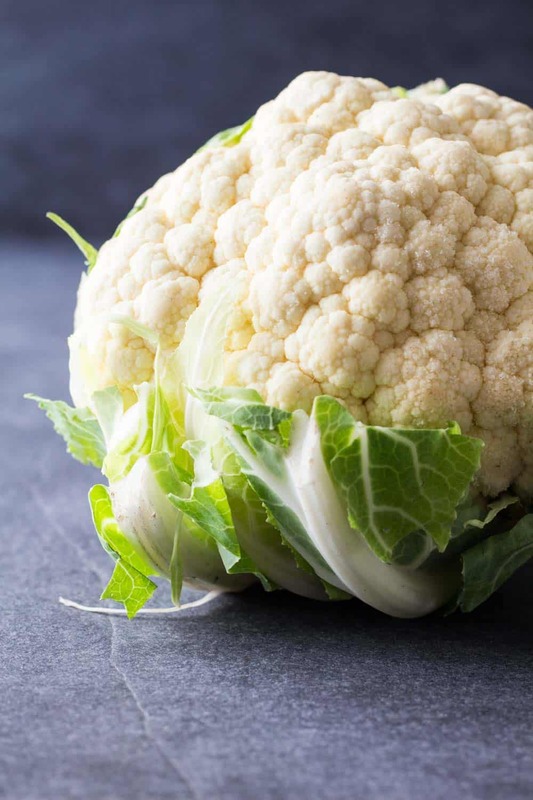 Cauliflower has tons of vitamin C and B6 and a good amount of folate, protein and fibre and combined with chicken and coconut milk makes it a not only delicious but also a very nutritious and complete meal. Both, chicken and cauliflower are cooked fairly quickly. It takes 10-15 minutes for the chicken to be cooked through and the cauliflower to reach the perfect tenderness it needs to soak up those curry paste flavors that make it taste out.of.this.world. How to make Thai curry in less than 30 minutes? You won’t be able to make a Thai curry totally from scratch in 30 minutes. However, most store-bought curry pastes (not all, but most) have what I consider fairly clean ingredients. The one I use has spices (including red pepper), garlic, lemongrass, galangal, salt, shallot, and soybean oil. 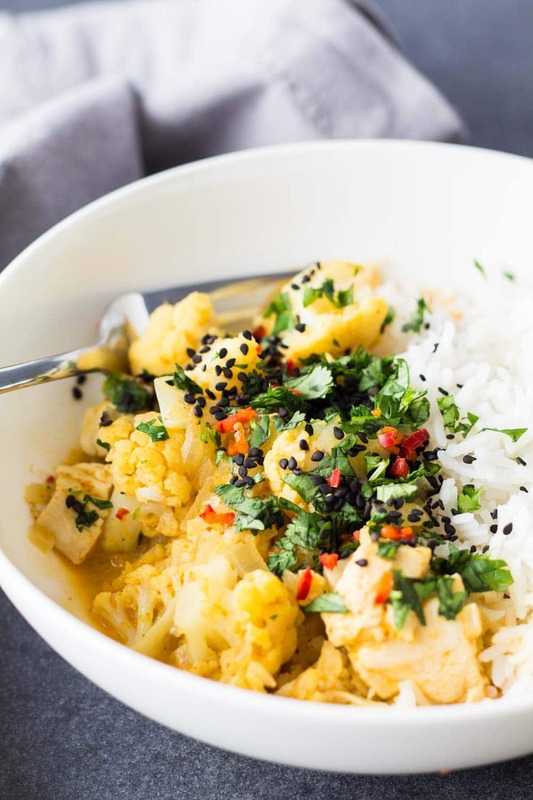 Now, yes, soybean oil is not necessarily the best ingredient BUT remember, we are only using a very small amount (2-3 Tbsp) of curry paste for this Thai Chicken Cauliflower Curry or any curry made with curry paste for that matter. Besides, we have to see the benefit of eating all that cauliflower just because it tastes so good thanks to this great curry sauce. The paste has no monosodium glutamate or other funny “ingredients”. This is a good product to cheat on and not make from scratch. Of course, if you have the time and especially access to more exotic ingredients like galangal. By all means, make it from scratch!! It will last a long time in the fridge and you can make a lot of curries with your homemade version. 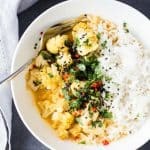 How long does Chicken Cauliflower Curry last in the fridge? And can you freeze it? Most animal protein lasts 3-4 days in the fridge. So does chicken. Which makes this an amazing dish for meal planning for the week. Make a double batch and eat it Monday through Thursday as lunch. You can also easily freeze this curry. If you plan on freezing it, I recommend undercooking the cauliflower. Add the chicken to the coconut curry first and after maybe 5 minutes the cauliflower florets. Cook until the chicken is done and the cauliflower still a bit hard. That way you get to the perfect consistency when reheating your curry in a pan. To defrost, put in the fridge 12 hours prior to eating and reheat in a pan or microwave. Alternatively, if you weren’t able to plan ahead, reheat frozen dish in the pan on low and moving constantly to avoid from burning. Pssst….for more curries because you can’t get enough, check out my Vegan Sweet Potato and Chickpea Curry or my Chickpea Spinach Curry. In need of a 30-minute healthy dinner? You found it! 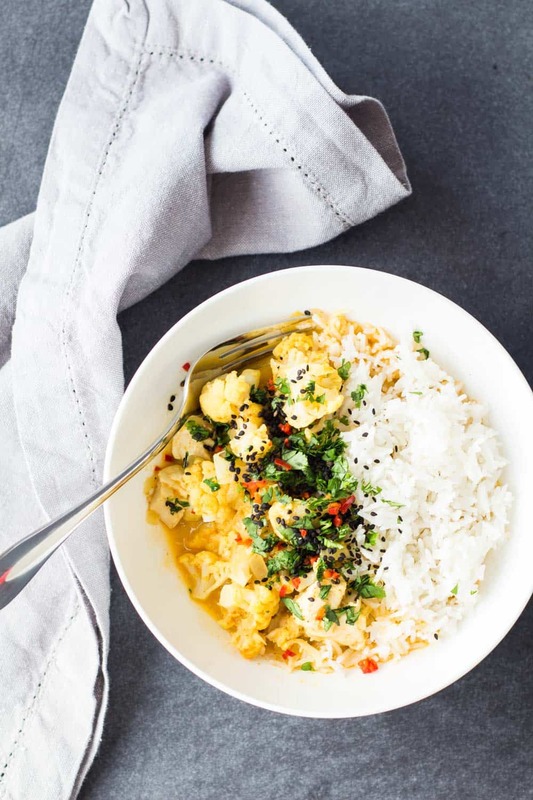 Thai Chicken Cauliflower Curry, the best, the ONLY quick and easy dinner you'll need today! Prepare your brown rice or white rice or quinoa or whatever you will serve this with. Peel and chop onion. Set aside. Wash and chop cauliflower. Set aside. Wash, dry and cube chicken breast. Set aside. Heat a large pan with lid over medium heat. Add a dollop of oil into your hot pan and then chopped onion and crushed garlic. Fry until translucent. Add coconut milk, curry paste, fish sauce and honey, stir well and bring to the boil. Don't forget to check your rice/quinoa. Once rice/quinoa is cooked remove from heat, fluff with a spoon, cover again and set aside. Once coconut milk is boiling, add cubed chicken and cauliflower, stir well, reduce heat to low and cover. Let simmer for about 5 minutes, then remove lid and let continue simmering for another 10 minutes. In the meantime, wash, dry and chop coriander and wash and chop a little chilli. Season curry to taste with salt and pepper. Serve curry over rice/quinoa and sprinkle with some chopped fresh coriander, black sesame seeds and chopped red chilli. I’m sorry if I missed it, but what kind of curry paste do you use? I’m in the US, so I know I may not be able to purchase the same one here, but just to have an idea. Can’t wait to try it! What kind of Thai Curry Paste are you using? Thank you! While this recipe looks fabulous, I’m genuinely curious where you got that spoon from!